Norway's She Said Destroy were once one of progressive death metal's most interesting acts yet has lain dormant now for four years, it only being by accident that I discovered this EP from January this year whilst giving 2008's excellent This City Speaks In Tongues another listen the other day. 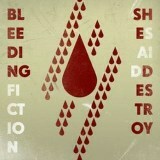 Bleeding Fiction is a single, long song, at just under twenty-seven minutes a real epic, and those who know the band will be pleasantly surprised at the band's slight shift in sound. It's artsy and classy at once, beginning in melodic grandeur with acoustic chugs and a mournful wall of sound that is gradually drowned in noise, launching into mid-paced technical riffage. Not quite a song, more an exploration of the band's subgenre, which is a progressive form of melodic death metal enhanced by a skilful ability in songwriting. The track grips as it progresses, vocalist Ugmod soon joining with his distinct yowl, yet it never gets too heavy, preferring atmosphere to sheer weight, so jazzy drum and bass meanders come to the fore with distant wailing melody, riffs changing and shifting, drummer Ventilator meandering delightfully, none of the three guitarists seeming to play at once but all making contributions, from chugging to acoustic murmur to soft progressive melody. I'd say as a whole Bleeding Fiction contains more prog than death, although there are moments of heaviness, particularly once you've passed the halfway mark and the band are sounding more like Daylight Dies than Death, melodic doom and technical death existing together before almost fading completely, returning in a single, percussion-backed guitar thoughtfully playing, building back into metal then fading to spooky ambience, ending on doom heaviness. It's a marvellous piece, all in all, that keeps you listening the entire running length without quite taking recognisable form as a song - this is definitely a creation, a musical movement, yet the band's songwriting ability has helped ensure that you're gripped. Hardly hummable, but it is compelling. Ultimately, what I hope Bleeding Fiction represents is a tease, a reminder from the band that they exist prior to a third album. Listening to this ep is frustrating for what it promises in the future, and although it delivers right now in epic spades there's still hope that an album will be along soon to build on this already impressive step forward. All too often metal bands come along, impress, then vanish, returning in a diminished form - if at all. It's good to see that this doesn't always hold true, and She Said Destroy are once again a name to watch out for.